Hello there, my name is Christa Wilkin. 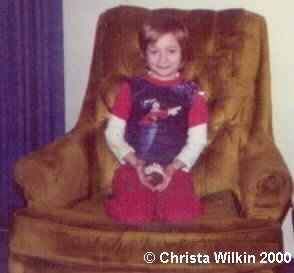 I was born in Heidelberg, Germany in 1968, and lived in Alexandria, Virginia from 1970-2007 when I relocated to Worcester, Massachusetts. My first experience with land hermit crabs came when I was five. My sister took me to the local Pets N Plants store, because she was interested in purchasing a parakeet. I think my Mom came along, but I am not sure. Anyway, my sister got a green male parakeet we named Budgie, and I threw a fit! I wanted a pet, too! So either my Mom or my sister agreed to buy me a hermit crab for 25¢. The crab was about the size of a quarter -- I named it 'Tink.' In the cage with Tink at the store was another, bigger crab. About a week later I got the bigger crab, too, and named it 'Tank.' This went on until I had Tink, Tank, Tonk and Tunk. I really liked those types of names as a child, for some reason. When I ran out of the basic names, I started in with Tinken, Tanken, Tonken, Tunken... and then Ink, Ank, Onk, Unk, and let's not forget Inkinstead, Ankinstead, Onkinstead, Unkinstead. You get the picture! I really can't explain my love of hermit crabs. It is something that just 'happened' that day in the pet store and never seems to have faded. Even after having Tank pinch my finger until it bled, and having had 20 crabs (and that's a conservative estimate) get lost in my home, I still loved Tank and all her cage-mates. I entered them in 'strangest pet' contests at my local public library. Tank had a spiny shell and I tied ribbons on the spines to make her pretty. I would take my crabs outside to climb trees with me, share my french fries with them, and take them to the beach with me on our family vacation. People would stop me on the beach at Nag's Head (where my family visited each summer) and inquired about my 'little friends.' Of course, since I wanted to be a marine biologist since I was five, I would give them a child's ten-minute lecture on their proper care and feeding. A lot of people sort of blinked and walked away, but that's OK. When you are hermit crab crazy, you get used to people's reactions pretty quickly! Crab Care Information has Changed Through the Years! Through the years that I've owned hermit crabs, a lot has been learned about their correct care. I never knew as a child that they needed to live in a humid environment. The book I had said to remove their exoskeleton after they molted and place them in spaghnum moss. When I first discovered all the fabulous information online about hermit crabs, I was absolutely on cloud nine. My fiance couldn't pry me off the computer with a crowbar. I read everything I could. I posted things I had learned over the years and ticked off some people because I didn't know the newer methods of crab care. I read and read, and learned and learned. I was like a crab sitting on a sponge for days and days, just sucking up all the knowledge I could! I got flamed on message boards, but I would not quit visiting them. I asked question after question after question about how to get my crab's care just right. I remember the first time I talked on the phone to Crablover Don. It was like talking to somebody I'd known for years and years. Finally, after all this time of being teased for my 'weird' pets, I met someone else whom I could chat with about the silly things that crabs do -- like obsessively cleaning their eyeballs, and stealing the sponge and dragging it out of the water dish. We talked about their chirping, about their personalities, and letting them ramble all over us. We consoled each other when our crabs were sick or died. Crablover Don was 'a hermit crab's best friend' in every possible way. He would not take any risks or do anything that could possibly harm his little 'creatures of God' as he called them. On May 3, 2000, I got an email from Kathy Jansen at Florida Marine Research that Crablover Don had died of a diabetes-related heart attack. The whole online crabbing community was in shock. We didn't know where to turn. Who would give us advice? Who would we call when we were frantically looking for help and FMR was closed for the night or weekend? Gradually things settled down a little bit. Don's friends stepped in to answer questions for newer crabbers, and gained individual respect for themselves. I spoke with Don's cousin, Mark, and made arrangements to fly to Birmingham, Alabama, and pick up his crabs. I brought (my new at the time, now one of my best crabbing buddies) Cerissa along for help and company. Overnight the crabs stayed in our hotel bathroom. 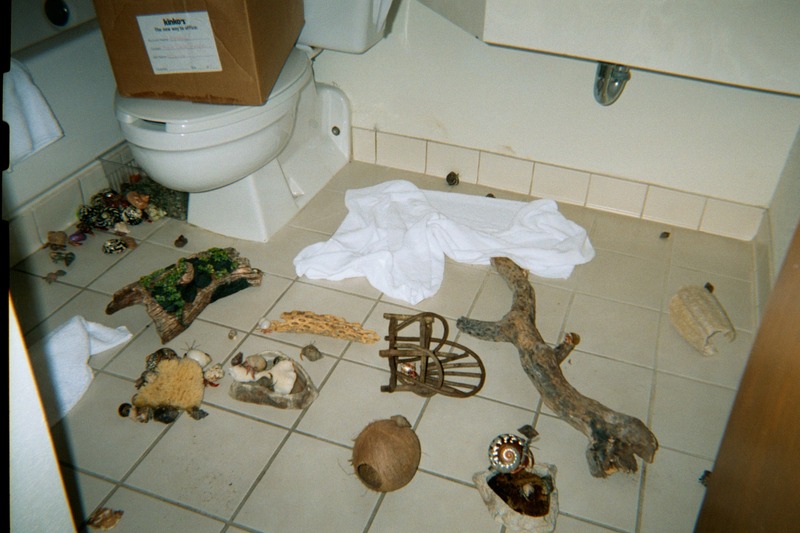 For a very large picture of how the hotel bathroom looked when it was full of Don's hermit crabs, click here. We were so excited about helping all Don's little orphans. Then disaster struck -- the airline would not let us on the plane with our duffel bags full of crabs. We had to rent a car and drive from Alabama to Virginia. It was a nightmare of a trip, but we made it. I drove the first seven hours and Cerissa drove the last seven hours. We finally pulled into Northern Virginia at 10:00AM. We brought about 120 crabs home from Birmingham that weekend. Some crabs died during the journey and others did not acclimate well to the new surroundings, but the majority of the 'Kritterland Orphans' survived Don's death and did well. As most people know, Crablover Don had friends all over the world. Everyone who talked or emailed him just fell in love with his kind, compassionate way of treating his little creatures of God. When Don passed away and I told people I was going to Birmingham to pick up his orphans, I was inundated with requests to adopt them. Asa Karlsson of Sweden, and her boyfriend, Roland, decided to take their summer vacation in Washington DC to adopt some of Don's crabs. Linda Kogin of New York also expressed interest in adopting some of Don's babies. We all got together at my house on July 22nd, 2000 and threw our crabs a party! Don's cousin Mark (God bless him) gave us over $2000 worth of hermit crab supplies, along with all of Don's orphans. At the Convention, we swapped crabbing supplies, and almost all of Don's orphans were adopted. The ones that weren't, I shipped out to friends of Don who were unable to travel to the Convention. So Don's 'Kritterland Orphans' went to Sweden, New York, Texas, Michigan, Georgia, Virginia, and Washington state. On May 20, 2000, I married Andrew Wilkin. We were married in the church I had attended as a child, All Saints-Sharon Chapel, in Alexandria. Drew is marvelously tolerant of my 'crab mania' and only gripes a little when I 'go overboard.' In June, 2000, Drew and I traveled to Germany for our honeymoon. The weather was perfect and the people were so friendly. We both hated to leave and vowed to return as soon as possible. Three years later, we traveled to England and absolutely loved it! We stayed at the Edward Lear hotel in London near the Marble Arch. Everyone was so nice and the history was breathtaking! We took a road trip to Glastonbury, where we visited the Chalice Well, one of the most revered "mystic places" in the world. In 2007 when we relocated to Massachusetts, I quit working. In January 2009, Benjamin came along and I am now a full-time stay-at-home Mom. In May 2007 my husband Drew became a licensed stockbroker, and it's about time, too! Way back when we first met, he gave me some good advice regarding retirement savings, and now when reach 65 I'll have half a million dollars, just from what I earned working as a legal secretary for ten years! Eventually I'll get his link up here so everyone can see and click on it, but in the meantime if you're interested in receiving sound financial advice from an honest man, look him up online. He also does education planning, which is crucial if you're like us and have little kids who will one day be college students. Additionally, an article about the efforts of the Hermit Crab Association by Dru Sefton of Newhouse News Services and forwarded to approximately 40 newspapers in the United States. Over the year my hobbies have changed considerably, especially after my second child came along! I am currently growing my second vegetable garden. This one seems to be turning out very well, finally fresh home-grown tomatoes, peppers and squash. I also seem to have picked up a very strong passion for the Boston Red Sox. You can also find me on Facebook but please note that I do not answer hermit crab related questions on Facebook because I have provided answers here in my website.